How low can the price go? Today we launch our newest offering… Bee Lights. They’re stunning. Couldn’t be happier with them if I tried! 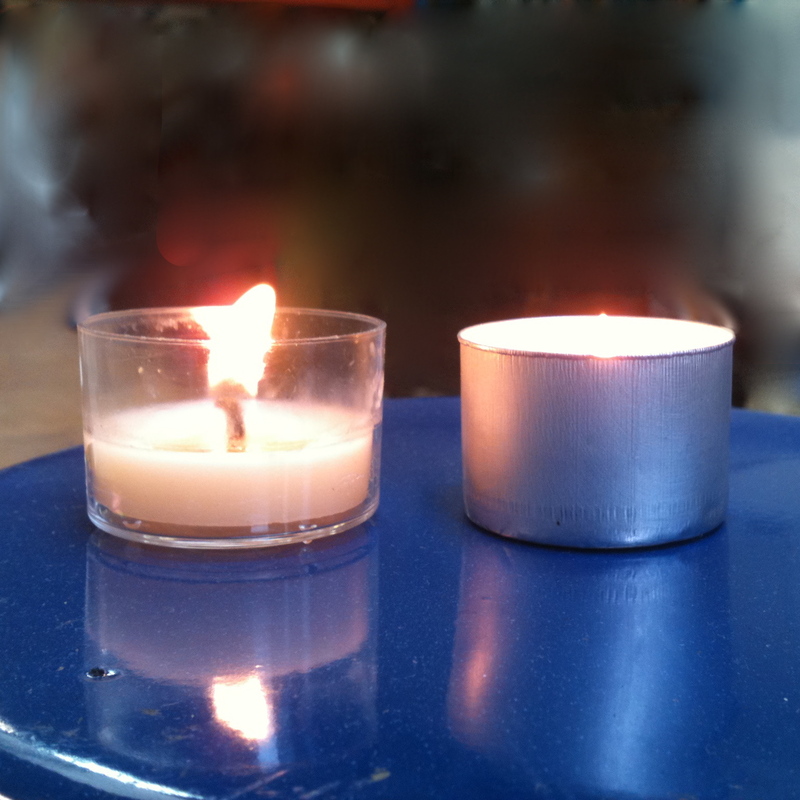 … they are an irregular size (around 7-8mm)… so you can have a lot of fun with making your own candleholders. [We’ll have a competition on that one shortly]. With Earth Hour coming up on Saturday, 26th March, I thought we’d do a little promo to get the word out. For every 50 packs of Bee Lights sold between now and 17th March 2011 (that will give us & Australia Post 9 days for delivering before Earth Hour), we’ll take $1 off the Earth Hour special price (to a minimum of $14.95). Click here if you just can’t wait to order. Yes, that’s right, you have the opportunity to get up to 40% off. Just this once. Won’t happen again. If I weren’t making them, I’d be buying lots of them while the special offer is on. I’d also be telling everyone I know! (well, actually I already am). And I’d be stocking up the pantry because soon pure beeswax candles from Queen B are actually going to be cheaper than using electricity. Oh, and I’d also be stocking up the pressie cupboard because even if the price does end up being $25, they’re a wonderful gift, and if it’s cheaper, then that’s even more wonderful (for you)! Just to be clear, you don’t need to buy 50 packs to get $1 off… I’m told that what I am doing is “crowdsourcing”. So we need a crowd of people to buy Bee Lights. The final price will only be determined at close of business on 17th March 2011. Basically the RRP of $24.95 will drop by 2c for every pack sold to a minimum price of $14.95. EVERYONE who orders as part of the promotion gets the minimum price, so don’t stress about what your order says. If you want to see what the final price was (before you get your parcel in the mail), just come go to the Bee Lights page on the website and it will advise the final price. A pack of 10 Bee Lights will normally retail for $24.95. On 18th March 2011 the price will be $24.95. So, you have a limited opportunity to buy a pack of Bee Lights for as little as $14.95. We just need to spread the word and get 500 packs pre-ordered. ORDER NOW. We won’t charge your card until the 17th of March, when the price will be determined by how many have been sold at that time. Why am I doing this (apart from to sell lots of candles)? 1. We have a lot of fixed overheads (rent, wages, vehicles, all the equipment etc etc). By choosing to use only 100% pure beeswax and to manufacture in Australia, we also have low margins (otherwise we wouldn’t sell any candles). So, that means we need to do volume. We know that once someone burns a Queen B candle, they understand the difference. So, we need more people trying (& loving) Queen B candles. If we could double or triple our customer base, we’d not only have a happier, healthier nation (and planet), but we’d also be able to cover our expenses EVERY month and do more to support the beekeeping industry. 2. Worker bees… we do about 50% of our revenue in the last 3 months of the year. That makes things a little quiet for the remainder of the year. And yet, it take at least 2 years to train a candle-maker properly, and I have to give them consistency in working hours in order to keep them. So, running a promotion like this keeps them busy. In fact I’ve already assumed it is going to be a roaring success (we usually get a huge reaction to 10% off, so I am anticipating meltdown with up to 40% off) and we’re already in production on bee lights. So, please help us spread the word. These are truly one of my favourite candles and are going to be a bargain at their RRP of $24.95 (for 10 candles). With this promotion, if we do it right, you have the opportunity to buy at up to 40% off. Order now knowing that we won’t charge your card until the 18th March when we know what the price will be set at. That’s no downside and lots of upside. We’re kicking off the Queen B Giveaway bonanza with an Earth Hour photographic giveaway (see earlier post on The Design Files for more about why we’re doing this). 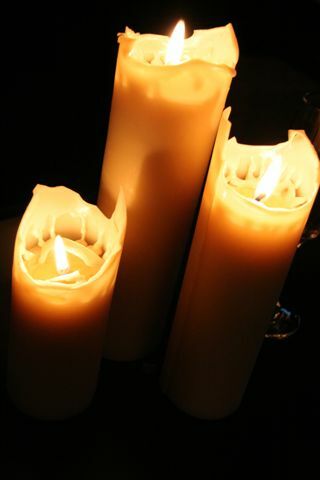 Simply capture a few photographs from your Earth Hour activities candlelit by Queen B candles (yes, I can tell the difference between a Queen B candle versus other toxic candles because a beeswax candle has a more golden light)! Upload your photographs to our Facebook fan page (click the Facebook link in the right hand column or go to http://www.facebook.com/pages/Queen-B/127493264895). Princess Bee and I will pick a winner who will receive $200 worth of Queen B candles (we’ll pick those too)! 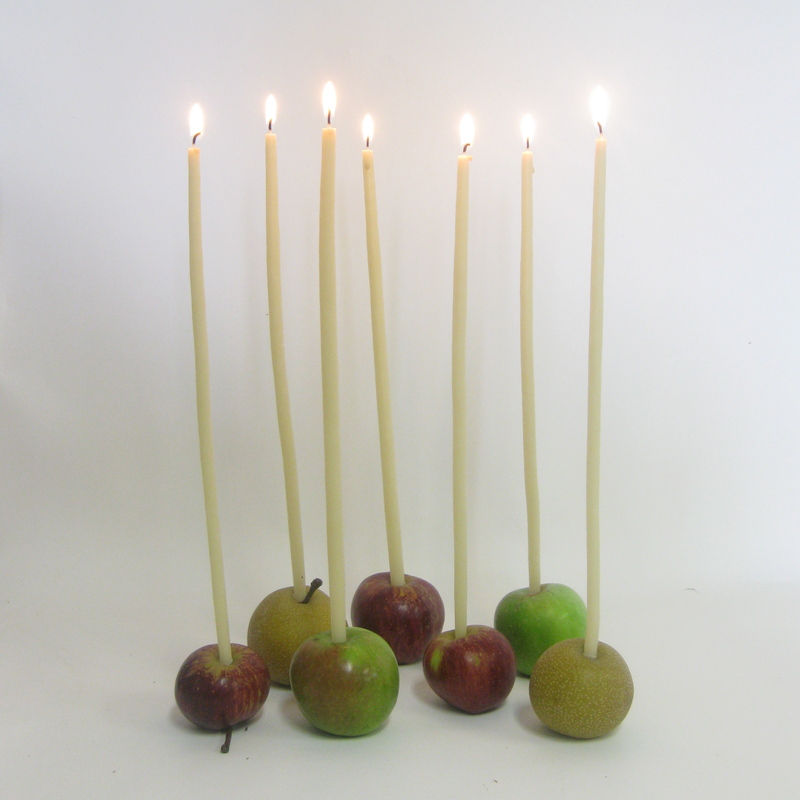 This year we’ve having to go it alone in marketing our pure Australian beeswax candles for Earth Hour. 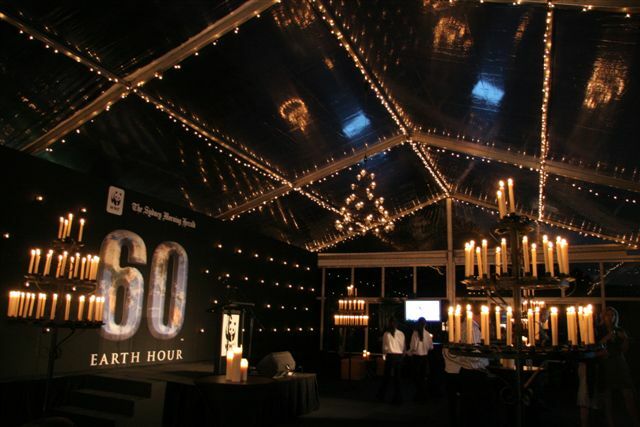 Last year WWF used our Eco-bulb as their official Earth Hour candle. [This year they have outsourced their entire store to a corporate apparel company who have sourced a torch from China to go with the t-shirts they have made in China]… ‘turn off your lights and switch on a torch’… not sure that it has the same ring or effect as a lighting a pure beeswax candle. 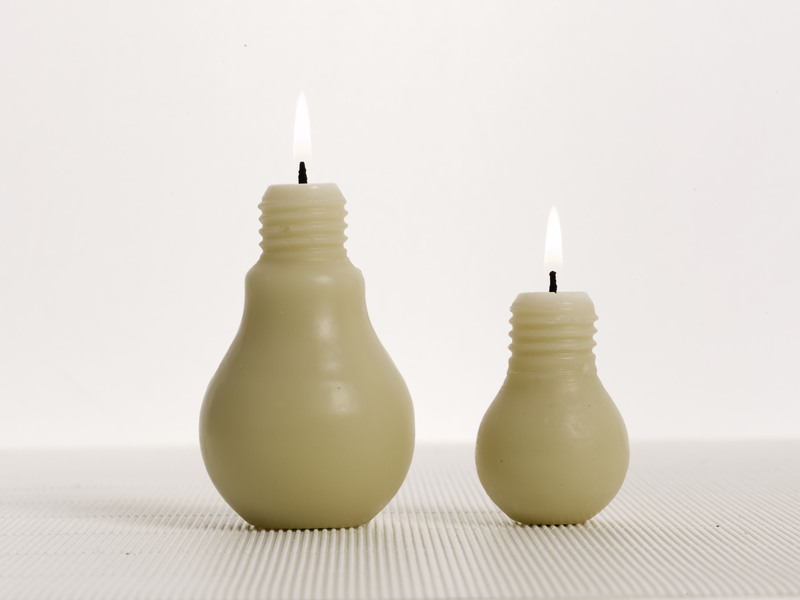 To celebrate Earth Hour 2010 we’ve created 100 Limited Edition small eco-bulbs to accompany the medium eco-bulb which is a constant part of our range. 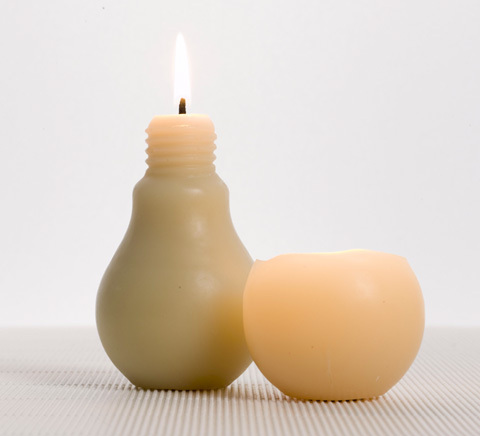 The eco-bulb’s burn really quite beautifully – the screw in part of the bulb burns away completely and then the candle burns down into the ‘bowl’ of the bulb… it took months of wick testing to find the right wick, but oh how good is it when we do?! 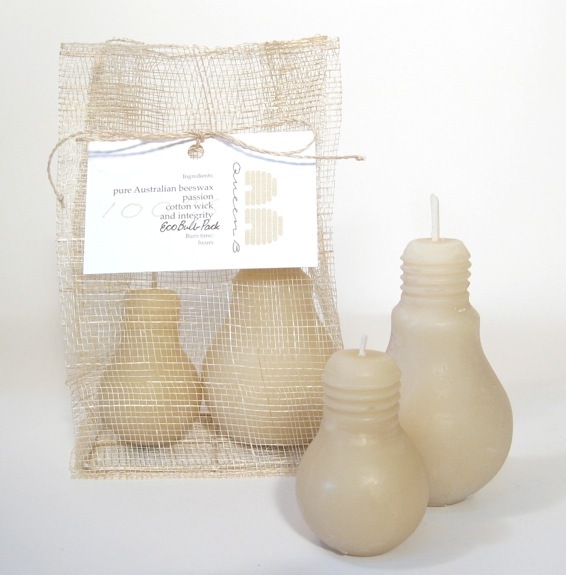 There are only 100 of these special Limited Edition Eco-bulb Duo packs. The two candles come packaged in one of our beautiful, bio-degradeable sinamay bags. To purchase the duo-pack online, go here – http://queenb.com.au/shop/index.php?cPath=206. 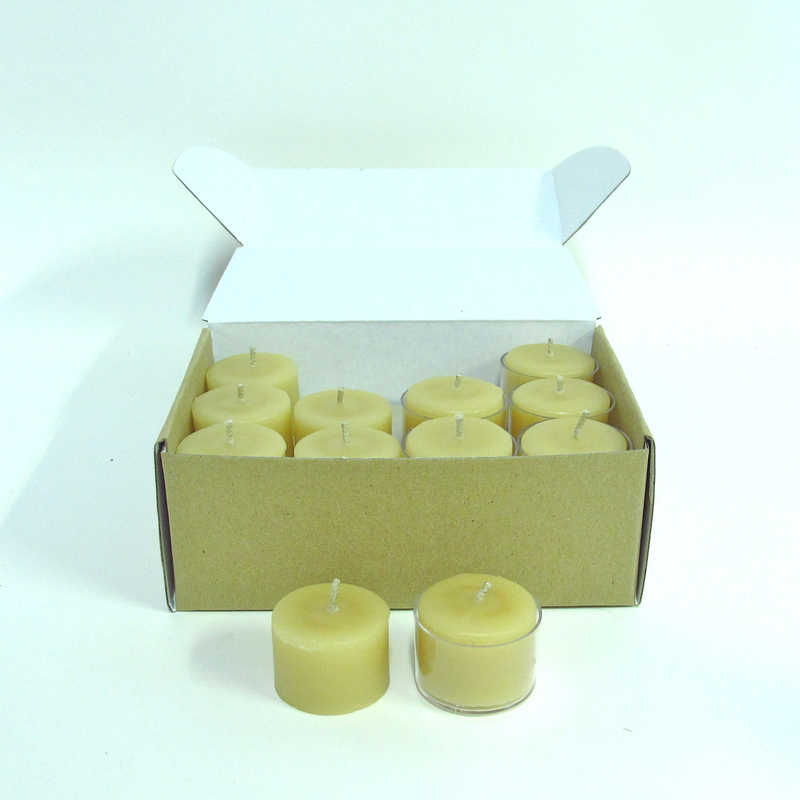 Earth Hour – Light a pure beeswax candle. 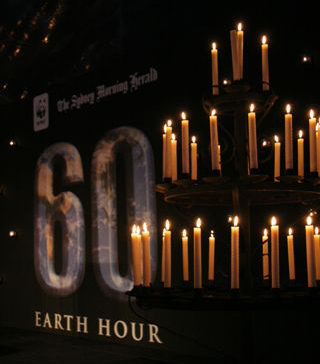 This year Earth Hour is being held on 27th March 2010 at 8.30pm. 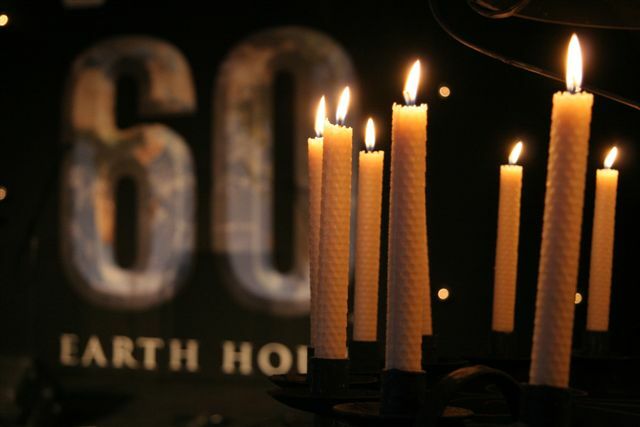 It is estimated that over a BILLION people globally will turn off their lights for Earth Hour. 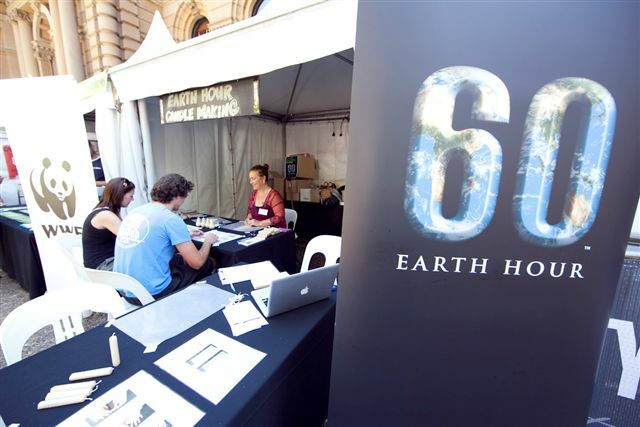 The event, which began in Sydney in 2007 with 2 million people switching off their lights, swelled to more than 50 million people around the globe in 2008. In 2009, participation intensified by hundreds of millions as 4159 cities, towns and municipalities in 88 countries, as well as many of the world’s best-known landmarks, acted for climate change. Organisers have stated that cities participating in 2010 have already overtaken those that took part last year. The World Wildlife Fund in Australia have been purchasing Queen B candles to light their landmark Sydney event since inception in 2007. 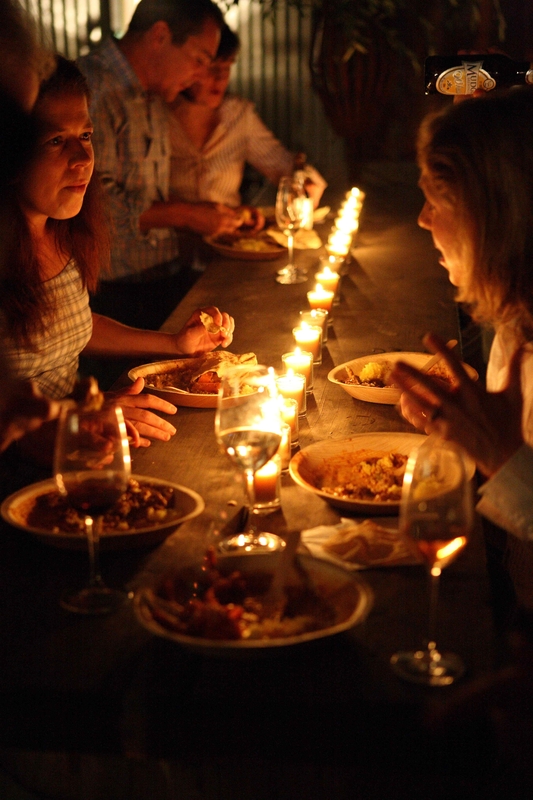 What will you be using to light your Earth Hour? Here are a few images from the official WWF events in past years.